Play video Who can win the F1 Track Memory Challenge? from BBC SportWho can win the F1 Track Memory Challenge? 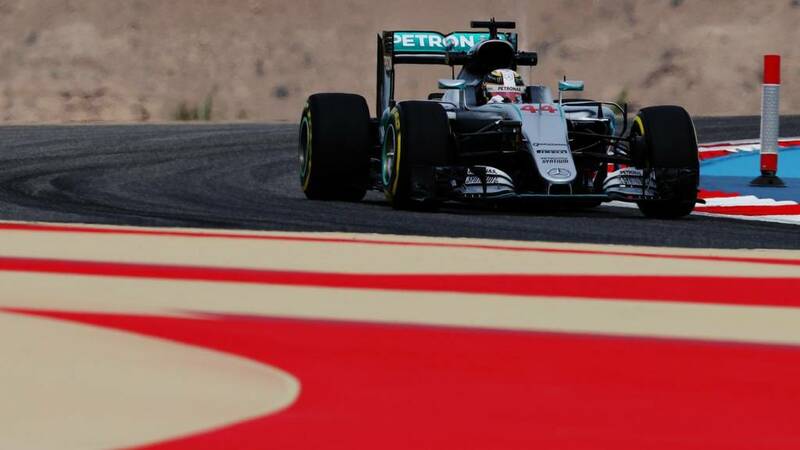 Get involved #bbcf1: do you feel cheated by F1? That's your lot from us. So far so good for Mercedes, who as expected look to be the team to beat once again. What we REALLY don't want to see is Ferrari's challenge falling away. After some problems today, can they get it together for qualifying? Join us for our coverage tomorrow, starting with final practice from 12:00 BST. Head here for Andrew Benson's thoughts on second practice. Ta ta for now. Sebastian Vettel made good use of that unexpected bit of time out of the Ferrari towards the end of the session, watching the action from the edge of the circuit. "McLaren will take a lot away from this performance, with Jenson Button P3. The pattern of the weekend has been set - Mercedes are way out in front." 1) Rosberg 2) Hamilton 3) Button 4) Verstappen 5) Raikkonen 6) Vettel 7) Kvyat 8) Bottas 9) Ricciardo 10) Massa. It's Nico Rosberg's day as he tops both sessions, Lewis Hamilton not getting it quite right in the latter stages of his laps during his qualifying sim. Not ideal for Ferrari as Sebastian Vettel - the most likely to challenge Rosberg and Hamilton this weekend - had problems. Nico Rosberg finishes fastest in second practice for the Bahrain Grand Prix. Haas managed to get Romain Grosjean's back out for the final minute or two, but another problem? There's a few whips of blue smoke coming from the car before he pits. Plenty of cars out on the circuit as we enter the final minute of second practice. Sebastian Vettel himself, meanwhile, has joined some snappers behind the barriers between Turns 11 and 12. A good chance to take in another perspective of the track and get some insight he might not get from behind the wheel. The picture is starting to become clearer regarding what happened to Sebastian Vettel. His left rear is wobbling at the Ferrari is lifted into the air and Sebastian Vettel confirmed that was a problem on team radio, saying: "The rear left corner was not tight." "Sebastian Vettel lost drive because he was stuck in neutral so the team thinks it might be an electrical problem." That debris came off Romain Grosjean's Haas. He caught the kerbs at Turn 13 and lost part of his front wing. It has been cleared away and the circuit is green again with six minutes to go. "No-one is looking that stressed at Ferrari. So hopefully what happened with Sebastian Vettel is a fixable problem and not going to require a power unit change." The virtual safety car is initiated. There's debris at Turn 13. Now Jenson Button has a problem and sounds more than a tad spooked over team radio as he says: "Er what was that on the straight!? I had a sudden cut out." Sebastian Vettel on team radio: "Something is not right. I stop the car. I lost drive."